Just hours after birth, Camille Kerlin (daughter or Rick Kerlin) was rushed to the Riley Children's Hospital at IU Health as she was born two and half months early with a congenital heart defect. Doctors stated that Camille "was a 5% baby" meaning that she was only given a 5% chance to survive. But, after 3 heart surgeries, the most recent in 2010, Camille decided to push on through all the odds. For a group of businesses to be in business for 90 years, they have on one thing to thank for that success; and that is the support of the community! We are so blessed to live in a community that cares about the well-being of our neighbors as much as our does. Many international organinations recognize the Warsaw area as one of the nations largest supports to renoun organizations like Riley's Childrens Hospital and American Diabetes Association. Has the work of the organization effected a member of our Kerlin Team in some way. Who do we support and partner with in outreach? Just hours after birth, Camille Kerlin ( daughter or Rick Kerlin) was rushed to the Riley Children's Hospital at IU Health as she was born two and half months early with a congenital heart defect. Doctors stated that Camile "was a 5% baby" meaning that she was only expected a 5% chance to servive. But, after 3 heart surgeries, the most recient in 2013, Camille decided to push on through all the odds. Today Camille runs an anual tennis tournament called "Raquests for Riley" raising money for the local KC Riley Fund giving right back to help kids like here at their hospital. As seeing the work of the Riley Team, we are so proud to be able to help support the work of the Riley Children's Hospital! 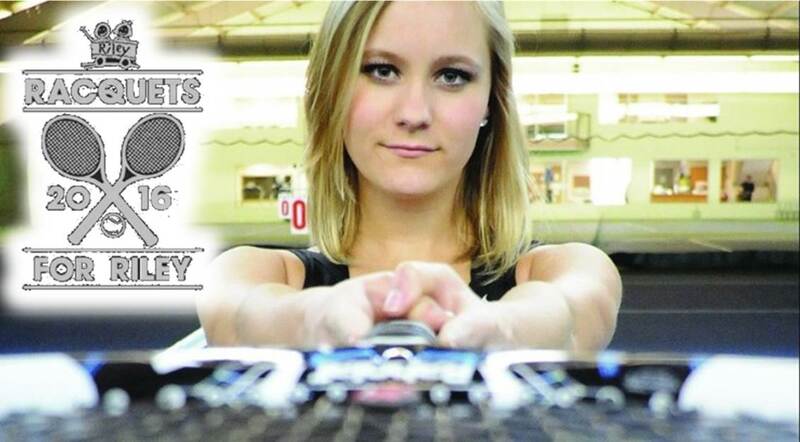 Year to Date the Raquests for Riley program has raised more than $41,000! This really neat event uses the power of a 50,000 watt radio station to spread the message of the wonderful work being done down in Indianapolis at the Riley Children's Hospital or IU Health. 50 Men Who Cook is a part of the local radio station's , 107.3 WRSW, fall festival "Octoberfest". This is a very unique oppurtunity to no only raise much needed funds for Riley's, but also allowing us to be in front of thousands of individuals that truely care about this outreach and explain how Riley Children's Hospital touched our own lives. 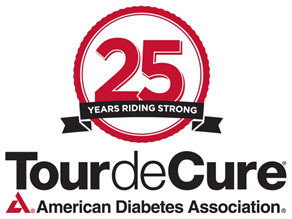 Tour de Cure is a bike ride through Indianapolis each year in an effort to raise funds to fight diabetes. 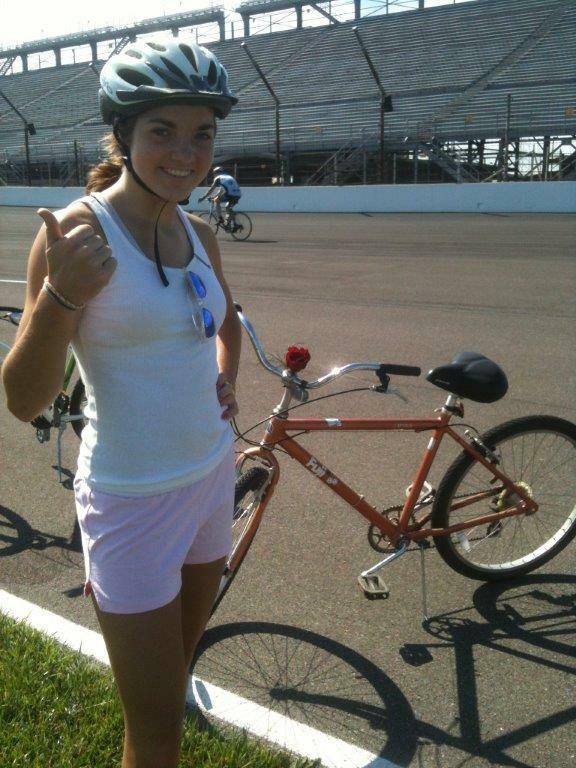 Each year "Team DeCure" raises money and rides at the Indianapolis Motor Speedway for this great event that is very close to our hearts! 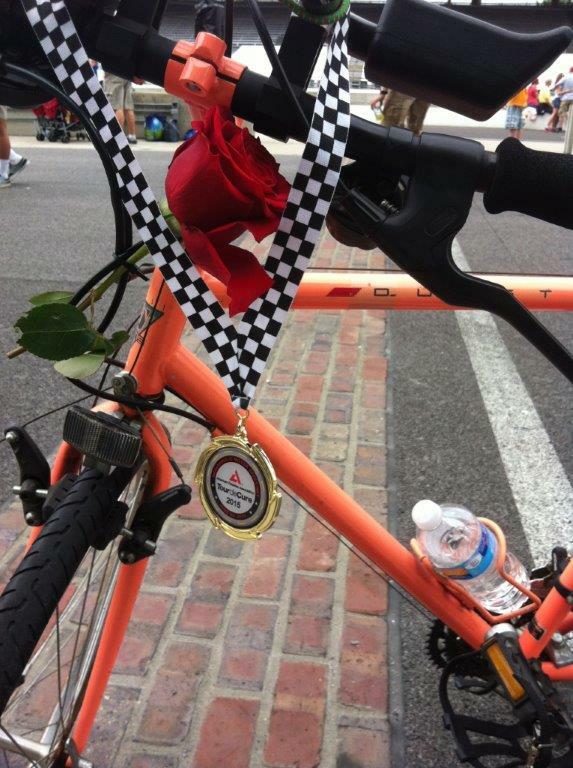 In the picture below you see a rose mointed to our bike in loving memory of Jacqueline Kerlin, wife of Ted Kerlin and mother of Rick and Valerie. Each year, people right here in our own community go cold. They simply of not have the coats, hats or gloves to stay warm over the colder months. 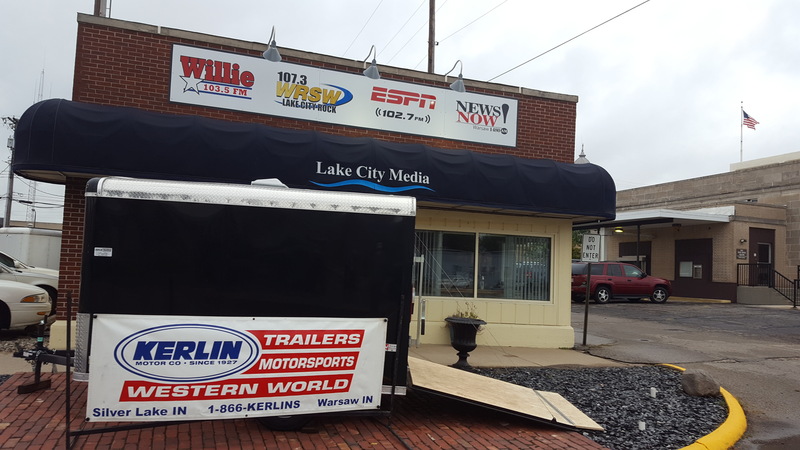 This is a real need in our community, so for 18 years the Kerlin Family of Businesses have partnered with Lake City Media Group, Wildman Business Group, Peerless Cleaners and Combined Community Services to collect these necessities for those who need them. This is a great way to reach needy people right here in our community with no financial commitment! Just donate your old coat! 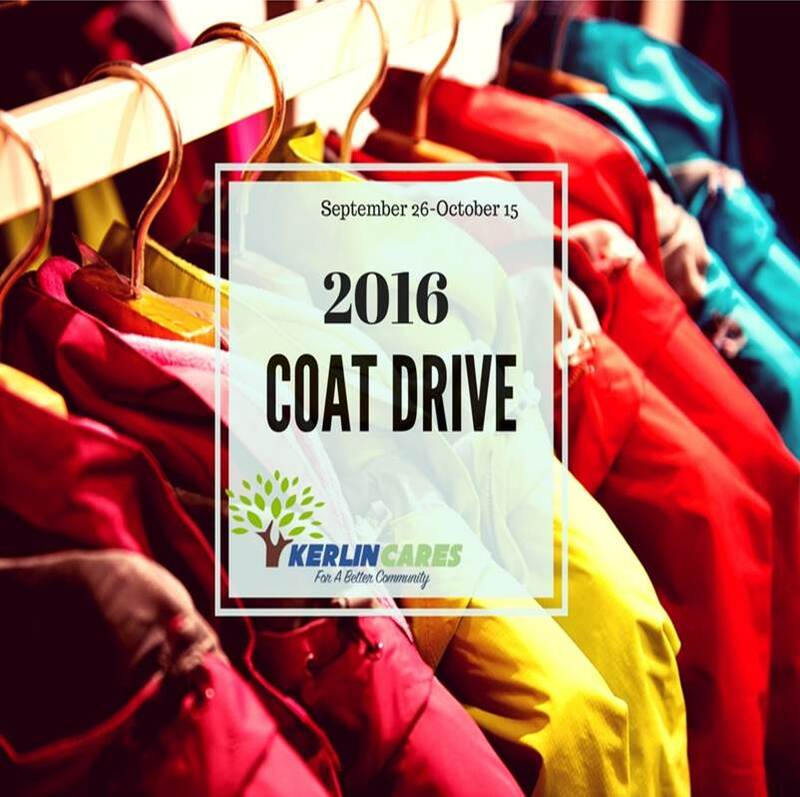 Coat Collected Year to Date 18,745 coats!